Sitting is the new smoking. Staying sedentary for several hours a day increases your risk of diabetes. So should you stand as a GP? I remember visiting my GP as a child. Sit in the waiting room normally sullen and low because of yet another episode of tonsillitis. Then I was called into the doctor’s office. I would enter a room that CQC would now shut down in a heartbeat with mosaic rugs, plush furry chairs, and a beautiful mahogany desk. And there was the GP….sitting behind his desk. I remember him moving in his chair to get some forms from a cabinet. I remember him asking me to stand as he examined me sitting in his executive chair, and I remember him always sitting behind a desk. Fast forward to a couple of years ago. I remember finishing work with my shoulders feeling tight, my lower back aching for a stretch, as I scooted in my chair to get a form from my cabinet next to my desk. It was at that point I realised I had been sitting in my chair for over four hours. I wanted to change this sedentary life. I had a chat with my partners and highlighted I would be changing my room. Shortly after I got a rising desk (Yoyo-90). I love it. The build quality is excellent with significant heft. The hydraulic risers are simple to clip and push my whole station upwards to allow me to stand. Initially I could only manage an hour or so before my legs tired out and I had to sit again. A further investment in a standing mat helped there. Within a month I was standing while doing all my admin. Then I took the plunge and stood while consulting with patients. Over the past year, I have not found any of these to be true. In my clinic, patients sit while I stand (see the chairs above). If a patient feels uncomfortable I will sit, however, I have only been asked this twice in the past 18 months. When there is a need for additional empathy, I often sit next to the patient. I actively share my screens when needed with the patients. 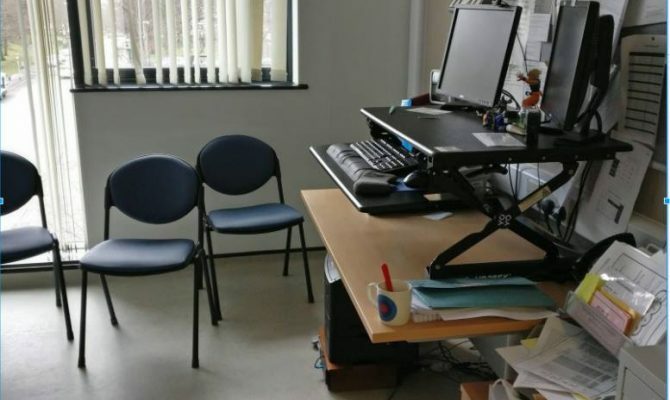 Patients often comment on the desk, about seeing similar in the media and how positive such changes are. Sounds encouraging and even our Secretary of State for Health and Social Care – Matt Hancock is very pro-standing desks. Encouraging our patients to be more active is important. So for Self-care week, I am showing how it works in my practice. Watch the video below and feedback your thoughts on should you stand as a GP?